Keen to encourage neighborhood density as well as create an investment opportunity, the initial brief for a single-family home quickly evolved into a twinset of compact adjoining dwellings, one to be kept and the other sold. This new brief called for two homes each with a more modest, narrow footprint without compromising on an abundance of light, space and storage. “Hideaway” in Hideaway House, alludes to both the desire to create a secluded haven, removed from its immediate busy urban context, as well as the ability to manage and conceal the everyday “messiness” of family life. Splitting the site down the middle meant having to navigate long narrow proportions when it came to planning. Furthermore, the site stretched west to east with little to no northern aspect. This proved tricky when designing a light-filled home with a sense of spaciousness. In response to this a series of courtyards are inserted into the plan resulting in all main areas being flanked on either side by green. These provide generous connections to the garden, encouraging an inward-looking seclusion yet making the house feel abundant and broad. Storage, secondary and circulation spaces were strung out along the inner edge of the building. A powder room, pantry, laundry, store and coat closet are all carefully concealed within this "joinery spine" that disappears into the walls. A thoughtful employment of every usable area keeps the house compact yet affording a surprising amount of storage. Joinery doors pop open to reveal typically messier functions such as a breakfast bar, a child's desk and a dog kennel with it's own door to the rear courtyard. This "hideaway" aspect allow these spaces to be readily accessible yet easily concealed when needed, allowing privacy to be controlled, and order and discretion to be maintained. The memory of the original dwelling, which burnt down, is referenced by running a darker palette along the new house’s northern edge to match the existing charred brick walls on this boundary. The black kitchen and ash-stained cedar walls help create a visual offset to the lighter warmer oak and a sense of intimacy. The continuation of this colour scheme across glazed thresholds blends the interior and exterior spaces, extending the living areas into the gardens visually. 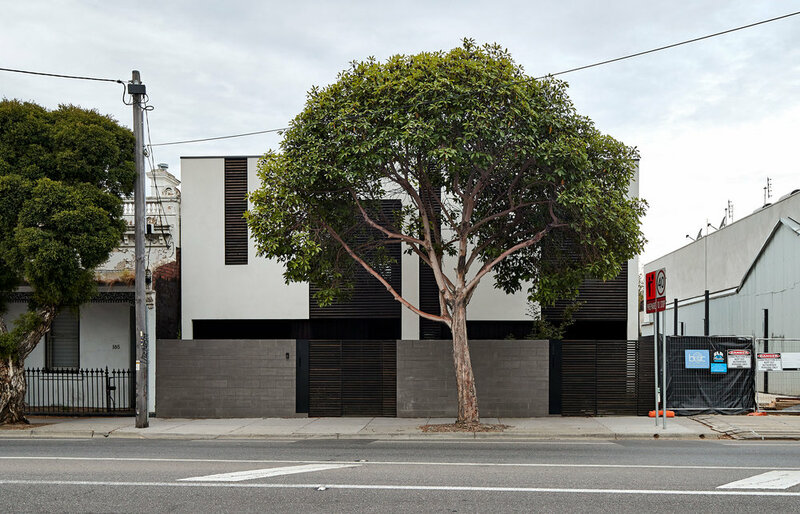 With a clever trick or two up its sleeve, Hideaway House packs a lot of punch for its size. It is a flexible, uncluttered, low-maintenance home with a few surprises that always manages to incite a little smile.